Front of the recipe card for Brownie Mounds. There are lots of fun recipes to read in the box this recipe for Brownie Mounds was with. 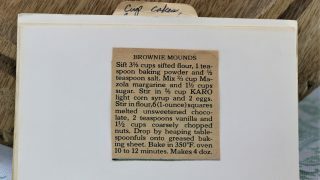 Use the links below to view other recipes similar to this Brownie Mounds recipe. 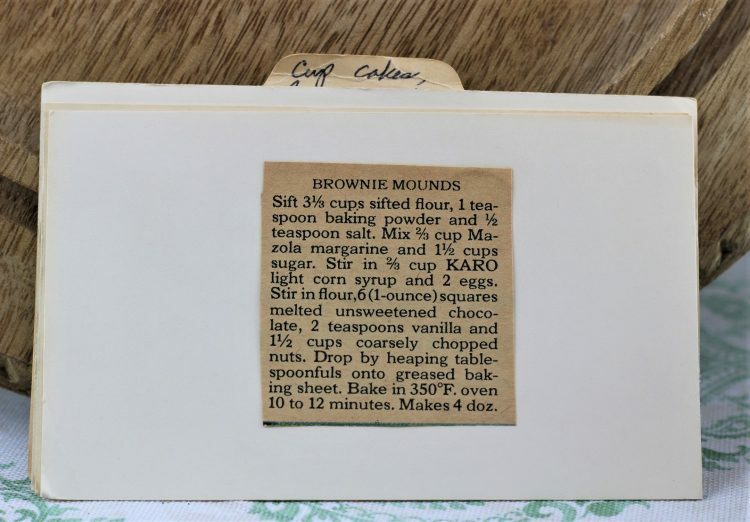 If you make this Brownie Mounds recipe, please share your photos and comments below! Sift 3⅓ cups sifted flour, 1 teaspoon baking powder and ½ teaspoon salt. Mix 2/3 cup Mazola margarine and 1½ cups sugar. Stir in 2/3 cup KARO light corn syrup and 2 eggs. Stir in flour, 6 (1-ounce) squared melted unsweetened chocolate, 2 teaspoons vanilla and 1½ cups coarsely chopped nuts. Drop by heaping tablespoonfuls onto greased baking sheet. Bake in 350°F. oven 10 to 12 minutes.